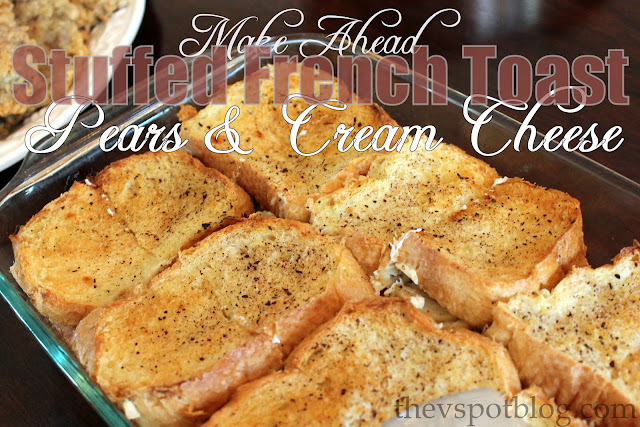 One of my favorite breakfast/brunch recipes is for Stuffed French Toast with Pears and Cream Cheese. I serve it every Mother’s Day and have made it for Christmas morning on several occasions. In a large skillet, saute pears and brown sugar in butter over a medium heat for about 2 minutes. Add the rosemary. Cook about 2 more minutes. You want the pears tender, but not over-cooked. Place a single layer of bread in a greased rectangular baking dish. Spoon the pear mixture evenly over the layer of bread. Mix the cream cheese and orange extract (or liqueur) until totally combined and smooth. Melt the other 2 Tbsp of butter and brush over the tops of the bread. Sprinkle with the cinnamon and sugar. Whisk together the remaining ingredients, and pour slowly over the bread slices. You want to do this slowly so that the milk and egg mixture can really soak into the top slices of bread as you pour. Bake, uncovered at 375degrees for about 40 minutes. The toast should look puffy and golden brown around the edges. Let stand for about 10 minutes before cutting into it. Hello! This sounds amazing!! I’m so making this next week. Thanks for sharing!! Yumm! This sounds super delish. Thanks, Viv! I’ve made stuffed french toast before but this one looks WAY better!!! One word…YUMMY! May have to use this one at the lake cabin this weekend! Oh lawsie mercy….I think I just gained 5 lbs…but it was worth it! HA! I like make ahead recipes…because I tend to freak out at the last minute! Delicious inspiration: 40+ Mother’s Day Brunch Recipes.